Sonicsgate Begins — Paolo M. Mottola Jr.
Let the Sonics move. I don't care. I can't afford $50 a ticket to sit in the upper tiers of Key Arena anyway. I get a better view of the game on my TV. The old Coliseum was renovated to the then state-of-the-art Key Arena just 10 years ago, and it cost taxpayers $74 million, according to the AP. Now the Sonics are asking for a $220 million renovation of Key Arena, want a new arena in a Seattle suburb, like Bellevue, or threaten to move out of the Northwest altogther. The Sonics say they have lost about $60 million in the past five years, and blame a revenue-sharing lease with the city of Seattle that expires in 2010. "A substantial amount has been done for the baseball and football teams. I'm here personally to find out whether the same is being considered fairly for the NBA," said NBA commissioner David Stern, visiting state legislators. Stern is right. Safeco Field, the most expensive new baseball park in North America, cost $517 million. Quest Field cost $300 million (Paul Allen shelled out 30% out of his deep pockets). I'll pay $15 to get into an M's game, regardless of the franchise's success. Safeco Field is home to the NFC Champion Seahawks, and Matt Wood will pay $200 for a playoff ticket without blinking. 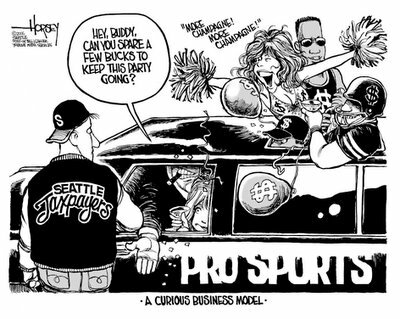 The problem with the Sonics' proposal is timing. Today, few will pay more than $50 a ticket to watch a stumbling NBA franchise, especially when the alternative is watching the Mariners, for a fraction of the price, or the champion Seahawks. Key Arena has 17,000 seats, roughly half the capacity of most NBA arenas, and the Sonics can only fill half the seats. I doubt Sonics tickets will be cheaper at a new or remodeled arena. So now the Sonics need a larger, newer arena for what? A higher empty-seat ratio? The Sonics are naive to ask Seattle for $220 million now. Build the franchise and then we can talk about building an arena.